Dr Met Castillo is a well-known church and mission leader in the Philippines and Asia. His consistent advocacy for obedience to the Great Commission and his involvement in missions have earned him the title “Mr Missions”. 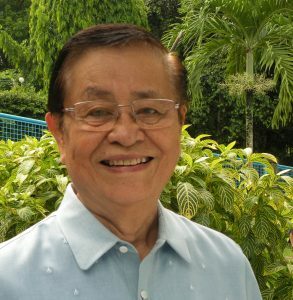 He has held a number of teaching and leadership responsibilities in theological schools and he was the founding President of the Alliance Graduate School in Quezon City, Philippines. Met was the Field Director of Philippine Crusades (now Philippine Challenge), the Manila-based ministry of O C International. His ministries include: training and mobilising Filipino and other Asian missionaries; Executive Director of the Missions Commission of Evangelical Fellowship of Asia; founder and General Secretary of the Philippine Missions Association, and catalysing sending structures among churches in Asia. He has written a number of books and articles on missions and church planting including Lets Plant Churches, the Church in Thy House, and Get Involved, Developing a Church Missions Program. He was the editor of Philippine Missions, Mission Asia, and Philippine Church Growth News, newsletters for local and international readers. He is a regular speaker at missions conferences and seminars in the Philippines and other parts of the world. Met has had meaningful cross-cultural experiences in Mindanao, southern Philippines, India, Singapore and the USA. As a resource missions speaker and lecturer he has travelled to many countries around the world. Dr Castillo served as the President and Professor of Missions at the Great Commission Missionary Training Centre (GCMTC), which he founded in 1994, a post he held until 2013. He is currently Academic Dean and is dedicated to the training of Asian workers for cross-cultural ministries. He is also the President of AEF International. Dr Met holds a BMS from Ebenezer Bible College, BD degree from Union Theological Seminary, India, and a Th.M. from Asbury Theological Seminary, Kentucky, USA. He also holds an M.A and Doctor of Missiology (D.Miss) from the School of World Mission at Fuller Theological Seminary, California, USA. Born in 1935 to a farming family in Ilocos Sur, Philippines, Dr Castillo came to know Christ as his Saviour and Lord at age 14 through the ministry of a Filipino missionary, from whom he received his initial missions orientation. He and his wife Inanama, are the proud parents of three children, Leah Joyce, Met Jr. and Donna Hope, who have given them six wonderful grand children.